Powdered drink mix made with less sugar and water than usual is frozen in ice cube trays for lip-puckering drink cubes or to eat as a cool snack. Spray plastic ice cube tray lightly with cooking spray; set aside. Combine drink mix and sugar in glass measuring cup. Gradually add water, stirring until drink mix is completely dissolved. Pour evenly into prepared ice cube tray. Freeze 4 hours or until firm. Remove frozen cubes from ice cube tray onto plate or plastic tray. This recipe was developed for a standard size ice cube tray. Do not overfill. Dip bottom of ice cube tray into pan of warm water for 5 sec., then twist to release the cubes. Store leftover cubes in resealable freezer-weight plastic bag in freezer. 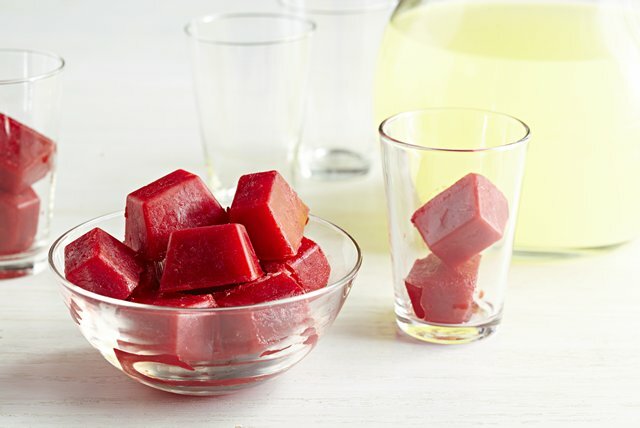 Add frozen cubes to any flavor prepared KOOL-AID to make your own Super Sour Kool Kubes Twist. Makes 7 servings, about 2 cubes each.